One of the great advantages of gardening in the Piedmont is that we gardeners can aim to have something in bloom for twelve months of the year—and we should never overlook the witchhazels. The witchhazel family, Hamamelidaceae, is a large one consisting of winterhazels, fothergillas, loropetalums, and the familiar witchhazels. Witchhazels are a great group of flowering shrubs that have nothing to do with witches or the hazelnut tree. It is thought that the “witch” is derived from the Old English “wych,” meaning pliable or bendable. It bears no relation to the hazelnut tree. There are two American species of witchhazel, Hamamelis virginia, which blooms in the late fall, and the winter blooming H. vernalis, a native of the Ozarks and rarely cultivated. The most common witchhazels found in our garden centers, however, come from the Far East: H. japonica, H. mollis from China, and the hybrids of these two species, H x intermedia. The most popular cultivar of these hybrids is ‘Arnold Promise,’ which blooms in February. 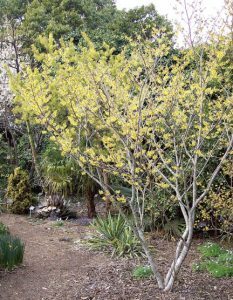 Generally the Chinese witch hazels are considered preferable to the Japanese ones, as their blooms are larger and more fragrant. ‘Diana’, ‘Jelena’, and ‘Pallida’ are also popular cultivars with ‘Ruby Glow’ having the reddest flowers of any witchhazel. The witchhazel flowers are quite lovely, ranging from red to orange to the familiar yellow. Unfurling as though they were fiddlehead ferns, these blossoms can withstand temperatures as low as 0°; when the temperatures fall the flowers will curl up only to unfold when the temperatures rise. 3) they do not appreciate our summer droughts. After looking drab throughout the summer, the witchhazel comes into its own in the fall when its leaves turn a vibrant yellow. After the leaves fall the flowers will appear. Apart from its lovely fragrant flowers, the shrub has much to recommend. It is a slow grower requiring little pruning, while demonstrating at the same time a pleasing form with arching branches. It has lovely fall color and is relatively pest free. What more could you ask of a shrub? Witchhazel has much to offer in the winter garden. Just don’t forget to give it a drink of water during our frequent summer droughts. It lies inconspicuous in the summer, but cannot be forgotten if you want to savor it in the winter when it shines. Kit Flynn is a Durham Master Gardener and a member of the Advisory Committee of the Durham Garden Forum.